Elyse Marks is a restoration architect, with over six years of experience in both the restoration and preservation of historic structures. Over the past three years, her work has mainly been focused on exterior façade restoration of historic and landmarked buildings within New York City. Currently a Project Manager and Studio Head at CANY Architecture + Engineering, DPC, Elyse's areas of focus include façade restoration and historic building documentation, as well as architectural conservation, materials evaluation, and structural and material repair. 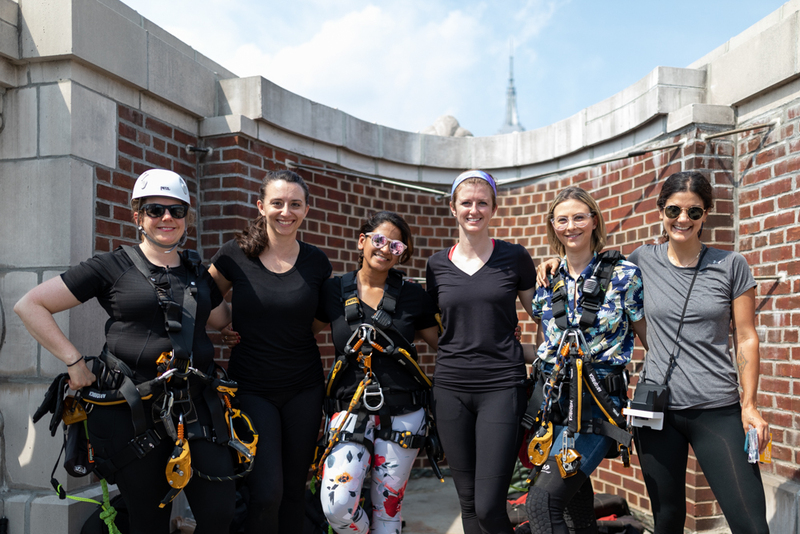 As a SRAT-certified rope access technician, she is able to gain access to all areas of a building to perform close-up inspections, with the purpose of identifying and evaluating deteriorated components of the building façade. Elyse has so far been involved in the restoration of several historically significant buildings in New York City and the surrounding area, such as The City Bank Farmer’s Trust Building (20 Exchange Place), The Plaza Hotel, the former Coty Building (Henri Bendel’s at 714 Fifth Avenue), Snug Harbor Music Hall, the Armor-Stiner Octagon House, and the Flatiron Building. She received her Bachelor’s degree in Architecture from Louisiana State University in May 2010, and a Master’s degree in Historic Preservation, concentration in Preservation Design, from Columbia University GSAPP in May of 2012. In her interview with Julia Gamolina, Elyse speaks about discovering her focus and her value, encouraging young architects to explore and set high goals. EM: I’ve always been an artistic person, so when senior year of high school rolled around and my mom asked me what I wanted to do, I said architecture! I had just taken a computer class where they taught us AutoCAD - this was at a college prep high school - and was really intrigued by the field. I got into Louisiana State University’s Architecture program and started to worry about how difficult the program might be. Then on day one, we started drawing and getting our hands dirty, and I immediately loved it. What did you learn about yourself through architecture school? The most important thing I learned was that I didn’t want to design new buildings [laughs]. About three years in, I knew I was good at what I was doing, but also knew that I didn’t love it; I was not enthralled. My grandmother was an antique dealer, and I always loved old things. I asked my professor if, for this assignment, I could pick an older building and jazz it up - they said no [laughs]. I went with the parameters of the project and got over it, but in fifth year, we had to design a train station in downtown Baton Rouge, LA. I went to my teacher and asked if I could, again, revamp an existing building on our site, that teacher said yes, and I finally discovered adaptive reuse. Did you pursue the historic preservation program at Columbia right away? Right after Columbia, I went to work for one of my professors - most of my professors also had their own practices - and I worked there until the studio shut down. Then I went to work for Howard Zimmerman Architects, a well-known restoration firm here in the city. That’s when I really started working under people who had an amazing wealth of knowledge about the city and the industry, and got introduced into this world which I am now really invested in. I also met my husband there - we were junior architects together. Elyse with husband Ben Lehrer, July 2017. Photo by Corey James Fontenot. I know you specialize - how did you find your specialty? I worked briefly under a woman named Joan Berkowitz, also a Columbia professor - very well-known in the industry, incredibly smart, and I learned a ton from her and found my specialty - turn-of-the-century masonry skyscrapers [laughs], a very niche niche. More specifically I would say, 1880-1930s masonry skyscrapers make up the majority of my projects. There are just so many of those buildings here in the city. The thing I love most about turn of the century buildings is that at that time, they were still learning so much about the engineering of skyscrapers, and the structural integration of steel and masonry and how to tie things together, so every time you start working on a new building, it’s like throwing out the rule book. A lot of elements are way over constructed, and then at the same time, so many are constructed in such a way that I always find myself thinking, “How did they not think this would fall off of the building one day.” In general you just find an overuse or misunderstanding of the properties of steel at that time. After I left Zimmerman, I briefly worked for Joseph Pell Lombardi & Associates, who is well-known in the preservation industry here in the city, but he owns a bunch of historic homes that are also house museums, like the Armor-Stiner Octagon House in Irvington. I worked for a couple of years with him on the restoration of these homes. I had this idea that eventually, I’d move back to Louisiana, so I wanted some experience with wood construction. It’s not something you can get a lot of here in the city, and I thought that if I wanted to be hireable when I moved back to the South, I better get some of that experience. I got my taste of that, but quickly realized I missed the Manhattan skyscrapers, and more specifically, I missed hanging off of buildings [laughs]. I didn’t start doing Industrial Rope Access (IRA), until this year. It’s a special certification that you need to have, so I got certified when I moved back into masonry facade restoration working with my current company, where rope access inspections are a service that they offer. Why did you end up moving back to facade restoration? I just found it more complicated, challenging, and mysterious. I’m a problem solver and love that aspect of it. One of the reasons I love my current firm so much is because they put a lot of faith in me. It’s really nice when someone sees something in you that you might not allow yourself to see. I’m definitely my biggest critic and I definitely suffer from imposter syndrome. I started at my current firm early last year - previously I was a project associate, which meant that I wasn’t a junior anymore, but still an “underling” in some ways, and I was trying to gain the experience to become a project manager. So I started out as a project manager, and at the beginning of this summer they promoted me to a Studio Head. It’s great, it’s really cool - granted all of these gray hairs are new [laughs] because I’ve found that managing people can be quite complex - but one reason I’ve really fallen in love with this company is because they decided to invest in me, and I find that that’s really rare in this industry. Elyse with her CANY colleagues, photo by Marco Catini. What have been the biggest challenges in your career so far? The path to licensure has also been very challenging for me - a long road with a lots of stops and starts. I would often hit a wall and it would be hard to find the rope and climb out of it. I had some issues with doubting myself - when my husband got licensed, he breezed through his tests, and for me it was a struggle. I took some tests more than once, but at the end of the day, I would just tell myself that I didn’t work this hard and invest so much just to give up. I’ve gone to job interviews where I feel like I didn’t get the job because I am a woman in my early thirties. They would ask me, “Are you thinking of starting a family soon?” And I’m thinking, “This is a really inappropriate job interview question,” but I’d laugh and brush it off, and then I wouldn’t get the job! Women at this age trying to navigate a male-dominated world definitely have challenges and you notice the way you’re treated versus the way your male colleagues are treated. I once actually had a boss tell me that I thought too highly of myself. Wow. What was your response? My responses was that that’s not a constructive thing to say! I thought that in that moment, he was failing me as a boss. The hardest thing for me was actually when my husband and I worked at the same firm, and started at the same level, and I watched him move up, whereas I wasn’t given that same opportunity. In the architecture profession, they always say that the way to get a raise or a promotion is to leave, so that’s what I did, and when I took an interview with another firm, right off the bat they offered me $25,000 more than what I was making. That’s how I knew what I could be worth. On the other side, what have been the biggest highlights, and what are you most proud of? The best feeling in the world for me was finishing out a job where I had a hand in everything - I was the drafter, the inspector, the associate, everything. Finishing that job, my first real large scale restoration job - and individual landmark down in the Financial District, a gorgeous turn of the century white speckled brick masonry skyscraper - felt really good. Do you know how many women say that about a job they’re completely qualified for?! Speaking of being ready, Elyse at the finish line of the TCS New York City Marathon, November 4, 2018. Listening to my gut - this comes with age. Having to make decisions in my job, because the client is looking to you and thinking, “You’re the professional, so we’re going to listen to you,” really made me in tune with my intuition. In the day to day, you end up having to make so many small decisions that end up having a huge impact, and going with your gut is really key. For example, I was doing a standard inspection on a building in midtown - every building over 6-storeys in New York needs an inspection every five years - and I noticed that a cornice was sagging a little on one end. It’s hard to tell sometimes if what you’re seeing is actually a deficiency, because you’re on a scaffold, hanging off a building, and can have a slightly funky perspective sometimes, but I just had a feeling that we should investigate further and do a probe - cut a hole in the roof, and see what’s up. The building owners were resistant - it’s expensive, and like surgery - but we opened it up, and I was looking at a structural outrigger beam that was deflecting and badly deteriorated. It was sagging, and hard! We pulled the whole roof off and ended up doing a huge structural repair job, but if I had shrugged my shoulders and said, “Eh, it’s probably nothing,” it could have been an emergency in the near future. Elyse on rope in Manhattan. With that in mind, what is your approach to your work? What we do is really about safety - in 1986, a Barnard student was walking down Amsterdam Avenue, and a piece of a building from Columbia’s campus fell off and killed her. This is how FISP started - Facade Inspection Safety Program. Yes, I’m a building nerd, I’m an architecture nerd, and every building in the city needs repairs after some time, but really what it comes down to is public safety. I know that too well now - one of my bosses said to me back in February, “If we didn’t do these inspections, a lot more people would get hurt.” That really solidified it for me - obviously I need to make sure I’m protected when doing these inspections, like closing down the sidewalks underneath, making sure I have a safety line, etc, but at the end of the day I really like the idea that my job is about making sure people are safe. It’s easy to assume when you are graduating from architecture school that there is this specific path that you’re supposed to follow - you join a firm, draft for three or four years, and then maybe you start going to meetings. There are so many more options out there though! I honestly probably wouldn’t be in architecture because I didn’t love it until I found my niche. I would recommend for someone just starting out to look at all the different facets of our industry and to not be afraid to create the kind of exposure you need for yourself if you are not getting it. If I had never asked to use the existing building as my project for that train station I designed my fifth year of undergrad, maybe I wouldn’t be here. I was also sometimes told that my expectations were too high. I wouldn’t be happy, and people would just say, “Well, welcome to the architecture profession.” That made me cringe because it really doesn’t have to be that way! I get that some people will stay, and do things they don’t like, even if it makes them miserable because they feel like they need to “pay their dues,” and yes, you do have to pay your dues, but you do not have to be miserable. Pay your dues doing something you like. You can set high goals for yourself, and I will never again sit there and let someone tell me that I think too highly of myself. I’m happy I didn’t listen to that [laughs].